One approach is to create the JFrame when the bundle's start method is called. When the bundle is stopped, it should clean up and thus dispose the JFrame. Bundles may have an "Activator" which is an implementation of the BundleActivator interface. The interface defines a start method - which is called by the framework when the bundle is started - and a stop method - which is called by the framework when the bundle is stopped. Pressing the "Stop" button in the guitool stops the bundle and closes the JFrame. The entry Bundle-Activator defines the class which is called when the bundle shall be started or stopped. The entry Import-Package defines the java packages which shall be available to the bundle which in this case must include javax.swing. As a little exercise, you may want to change the Import-Package entry and see what happens. The build scripts create the Import-Package entry from information stored in the build.default.properties file in the project. This file is in the root of project bundleswing1. In the line prj.bundle.import-package=org.osgi.framework, org.slf4j, javax.swing remove the javax.swing package and save the file. Then build the bundle by either running build-bundles.xml or the project's build.xml script. Install the bundle and start it. The bundle information will contain "Activator start error in bundle" and the Eclipse console will show " java.lang.ClassNotFoundException: javax.swing.JLabel not found by example.swing1 ". 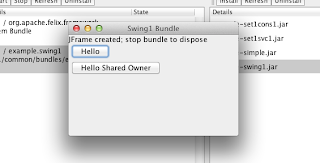 When creating a JDialog with a null owner, Swing creates a so called "shared owner frame". This will prevent a clean exit, when - as usual - System.exit shall not be used. The application will terminate and the JVM exits. This is the expected behaviour. The class HelloSharedOwnerAction looks like shown below. Interesting are the lines marked with bold font. 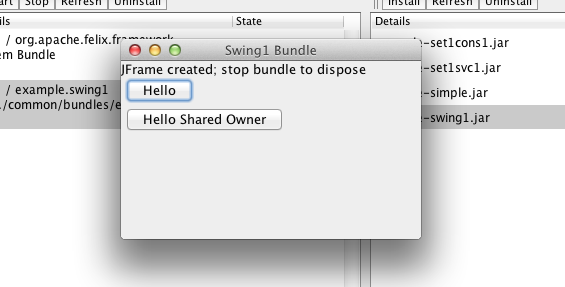 When passing null to createDialog, Swing sets a Shared Owner Frame as parent of the JDialog. The two bold lines in the propertyChange method fetch the owner and dispose it. As a test, comment these two lines out (the ones around parent.dispose()) and repeat the steps listed above, except that the button "Hello Shared Owner" is used. The guitool will disappear when pressing "Exit", but the JVM will not terminate. It does so, because a displayable component still exists. The two commented lines were disposing that component.